Adria has been called one of the best 3-knife jugglers in the US and will happily use this information to get gigs. She is also an occasional actress. 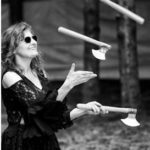 Her juggling résumé boasts some television performances, including two national appearances, a couple of movies, and many community events in the greater Tacoma and Kirkland areas. In addition to juggling performances, she appeared in a variety of stage and video productions, some of which toured nationally. Her shows are nearly 100% audience interactive and her self-written jokes are fun for the whole family. She holds the dubious honor of giving out, what she calls, “the worst prizes” to volunteers in her show. 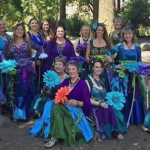 Jeweled Scarab Dance Company (JSDC) is a Middle Eastern Bellydance Fusion group consisting of dancers with a variety of levels, appearances, and dance stylizations. The main focus of JSDC is to incorporate the many varied styles of dance, from ballet to North African tribe dances, with traditional Middle Eastern and American styles of bellydance to invoke and exiting and mesmerizing fusion style of dance. 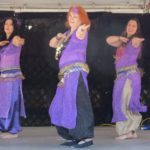 This is done by using moves, music, and costuming from various styles of dance and blending them smoothly and seamlessly with moves, music, and costuming of Middle Eastern and American bellydance. The result is a wide range of original routines performed by some of the most ambitious dancers in the area. DeAnn Hamilton is a life-long dancer. She discovered belly dance in 1982 and never looked back. Since then she has had a love affair with this body friendly dance form that provides great exercise as well as an avenue for joyful expression. Seeing a tribal style improv performance for the first time in 2003, DeAnn was greatly impressed with the powerful form and presence presented in the experience. She immediately sought out training and has devoted all her dancing energy to tribal since then. 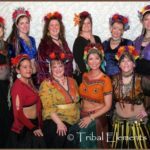 Under DeAnn’s direction, Lotus Tribe (dance troupe) enjoys performing at local events, haflas and fairs around the South Sound. Mas Uda Dancers, from the Olympia area, are known for the fun they have on stage (and off!) They meet on Thursday evenings at the Woman’s club of Olympia. The group encompasses all ages, occupations and dance levels. They dance for the fun it brings to them and to their audience and they have become friends through their dance. Troupe Rashaad, based in Thurston County, has entertained audiences around Puget Sound for over 30 years. 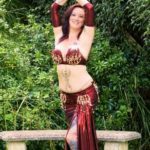 These belly dancers incorporate a wide range of cross-regional moves with musical inspiration from traditional and modern Middle Eastern, pop, classical, and a little bit of country. 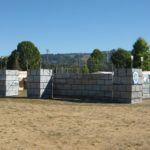 This year’s All’s Faire features several fast paced battles in a four hour war with two opposing castles. We are using a cross-gaming version of the Belegarth rules, that highlights the flavor of the different communities.